A historical costume drama, The Private Lives Of Elizabeth And Essex is a stage-bound talk-fest. Bette Davis delivers a powerhouse performance, but is severely undermined by an emotionally schizophrenic script. The elderly Queen Elizabeth (Bette Davis) is feeling old and lonely, but she is very much in love with the young and handsome war hero Robert Devereux, the Earl of Essex (Errol Flynn). As much as Elizabeth loves Essex, she recognizes his naked ambition and his desire to seize the crown for himself. Essex professes to also love the Queen, and does not hide his aspiration to be King, leading to a deep rift between them. Francis Bacon (Donald Crisp) is friends with both Elizabeth and Essex, but even he cannot arrange a reconciliation. Meanwhile the young and ravishing Lady Penelope Gray (Olivia de Havilland) wants Essex for herself, while Essex's rivals Sir Robert Cecil (Henry Daniell) and Sir Walter Raleigh (Vincent Price) actively plot against him. A rebellion in Ireland under the leadership of the charismatic Earl of Tyrone (Alan Hale, Sr.) gives Elizabeth reason to again call upon Essex's military services, but healing their relationship will not be easy. Directed by Michael Curtiz as a glossy and colourful adaptation of the play Elizabeth The Queen, The Private Lives Of Elizabeth And Essex has very few sets, many exceedingly long scenes, and interminable dialogue that circles the same topics for eternity. The plot hinges on whether or not the love between the Queen and Essex can survive his obvious ambition and her fierce determination to rule. And this point is debated endlessly, the laboriously long exchanges between them suffering from stunning emotional dissonance. Within the seconds the two move from lovingly laughing and kissing to serious threats of treason and decapitation, and then back again. This whiplash-inducing pattern undermines any credibility in the characters and is repeated several times, the same themes on replay at the beginning, middle and end of the film. Elsewhere there is an underdeveloped palace conspiracy to undermine Essex's power, an objective that he appears quite capable of achieving on his own. A brief sojourn into a battle in Ireland is laughably constrained to a small sound stage. 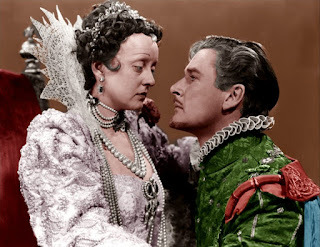 The fictional character of Lady Penelope Gray is introduced to give Errol Flynn and Olivia de Havilland another screen outing, but instead further erodes the narrative's integrity: de Havilland is stunningly fetching as Lady Gray, and the dashing Essex looking past her to expound love for the hideous Queen beggars belief. Lady Gray's actions should have also landed her neck on the chopping block within 20 minutes, but she somehow never earns the Queen's true wrath despite endless conniving. What remains are plenty of lavish costumes and a Bette Davis performance that ages her about 30 years, with the ugliest possible hair and make-up combination. She owns the role and commands the film with the same ferocity Elizabeth demonstrated in bossing her country. In contrast all the other performances fade into insignificance, including a flighty Errol Flynn. He looks absolutely dashing in tights and fighting gear, but is simply too lightweight to convince as the Queen's lover and rival. The Private Lives Of Elizabeth And Essex may have been intriguing, but the film lands squarely in the stodgy zone.